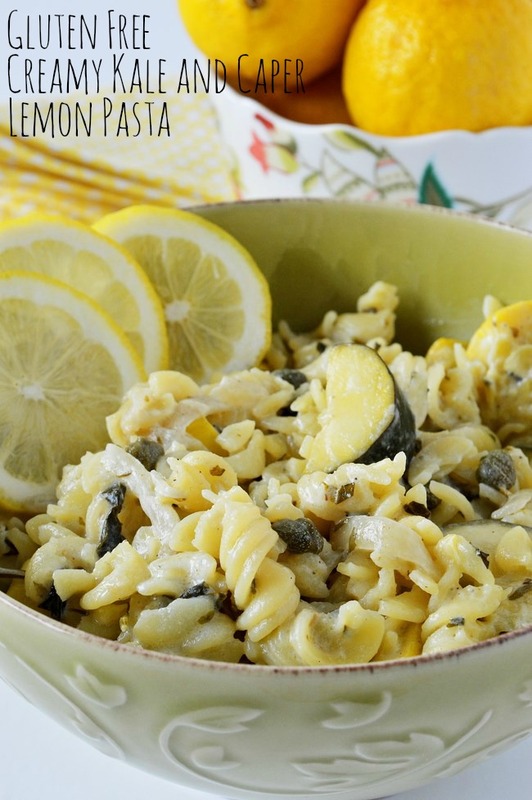 This Gluten Free Creamy Kale and Capers Lemon Pasta is a quick and easy dinner that is full of fresh vegetables and lemon flavor. 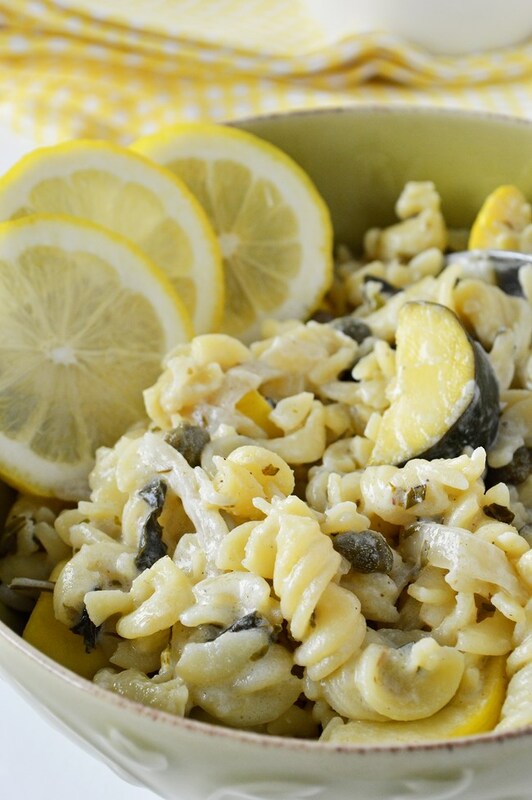 Summer squash, mushrooms, kale and capers really jazz this springtime pasta up! Springtime isn’t all about desserts, you know. Of course, I’m not one to talk. Between my Raspberry Lemon Bars, Vanilla Cake with Raspberry Filling and Meyer Lemon Buttercream, and my Lower Fat Strawberry Cheesecake Bars…I’m pretty much the number one culprit for some spring sweets. It’s just too tempting to pass up the brightness of all the fruits and vegetables that are now in season. It’s like the whole world, plants and people, have decided to come out of winter hibernation. And that’s a reason to celebrate. If you ask my husband whether he’s a main meal kind of guy or a dessert kind of guy, he will hands down tell you that the main meal is the way to his heart. He claims that he’s really not a sweets kind of guy. I say he is a liar. Seriously, I see him busting out Oreos or ice cream almost every night. In fact, I don’t think he can go to bed in good conscience knowing that he has passed up eating dessert. But, if he wants to claim that dinner really is his favorite part of the day…well then I better darn well jazz up dinner! I don’t want my main man sulking around for lack of dinner pizazz, now do I? And since all these lovely bright and colorful fruits and veggies are now on sale, there is no reason you can’t do the same. Last week when I was participating in my very own episode of “Chopped: Brielle’s Kitchen” (because, let’s face it, I never know what I’m cooking until I open the fridge and see the ingredients staring me in the face) I discovered a lonely zucchini squash and yellow squash just screaming to be eaten. Most things would scream NOT to be eaten, but I’m pretty sure that my fruits and veggies enjoy being eaten. Mostly because I like eating them, so that’s what I pretend. Although when I am trying to get my children to eat their veggies, I am usually acting out that their veggies are yelling out, “AHHH! DON’T eat me! No, don’t eat me!” But that’s only because my children are defiant and do exactly the opposite of what I tell them to. Please tell me ALL children are like this. So back to this pasta and those veggies that were just dying to be cooked. I couldn’t just let their dying wish go to waste. I HAD to cook them. And cook them I did into this lovely and aromatic Gluten Free Creamy Kale and Capers Lemon Pasta. Funny how the yummy squash I’ve been talking about isn’t even in the title of this dish. That’s the thing, though. This pasta has so many delicious elements, it’s just too hard to decide what’s best. And nobody wants to read a recipe title that is 20 words long. So let me get to the other stars of this dish. Let’s start with the kale. I have just recently discovered kale. Well, correction, I have just recently braved cooking with kale. I’ve heard people talking about it all the time. Blending it into green smoothies, tossing it into salads, and cooking it into main dishes. So, I finally pulled the trigger and bought a pack of kale…I LOVE IT! I’ve been using it in salads, in quiche recipes, in pasta dishes, sautéed on top of chicken, etc. I’m still not sure about throwing it into my smoothies. But then again, I’m just not much of a smoothie person to begin with. The kale in this pasta dish is cooked just enough that it’s soft in texture, rather than chewy and tough. Plus, it gives off a nice, earthy spinach-like flavor that rounds out the lemon. Now onto the capers. Ben was on this caper kick ever since he had a sandwich with capers. So I bought a bottle and have wondered what to do with it for months. Well, I finally figured it out. 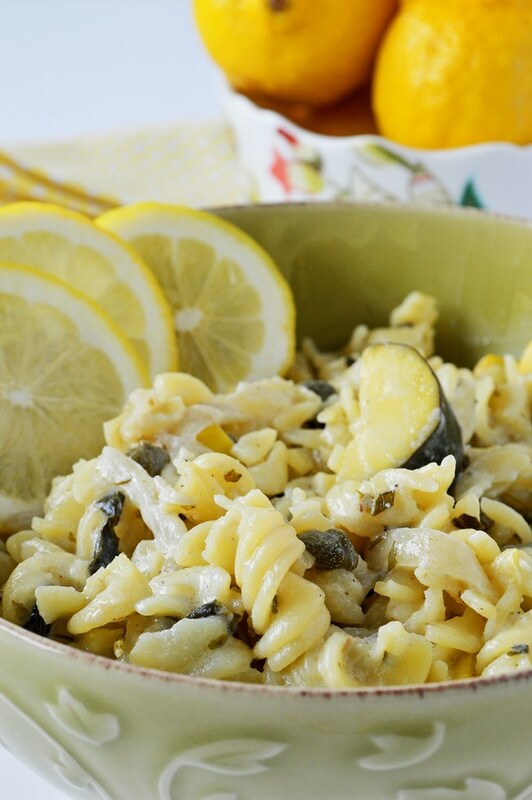 The capers give little bursts of salty goodness throughout the pasta without being overpowering in the least bit. Yay for capers! Good call babe. Good call. This next element is all Braelyn’s request. Sounds weird, but my five year old loves cooked mushrooms. So, whenever I get the chance, I throw some into whatever I am cooking. I enjoy mushrooms in the fact that they absorb any flavors you are cooking with. Every bite of mushroom is literally a flavor party in your mouth. And lastly? That good old summer squash combo. The zucchini and yellow squash are cooked just barely al dente, so there is a little crunch left in them, adding some variety to the texture of this dish. Yumm-o! But really, this dish just wouldn’t be the same if it wasn’t for the lemon cream sauce that gets all soaked into those lovely rotini noodles. I’m telling you, this sauce is killer! With the mixture of cream, chicken broth, and fresh squeezed lemon juice, you just can’t go wrong. You will definitely want a chunk of bread to go with this meal so you can dab up every last drop of saucy goodness. The sauce is so rich that Braelyn immediately exclaimed, “Cheesy!” I think she thought it was alfredo sauce. But, no, there is no cheese in this sauce. However, It is a little reminiscent of an alfredo type sauce only with some lemony zing added to it. Basically the sauce is creamy and it’s good and that’s all you need to know. So take a step back from all those springtime desserts and give yourself a real treat. Treat yourself to a quick and easy dinner that will knock your socks off and leave you licking your lips for more. It’s springtime baby! 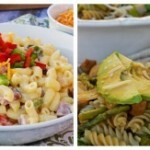 If you enjoyed this recipe, check out some of my other easy gluten free 30 minute meals. Begin boiling water in a pot to cook pasta according to package directions. In a separate large skillet/saucepan heat 2 tablespoons of avocado or cooking oil over slightly above medium heat. Once pan is hot enough that a drop of water sizzles, add onion. Generously season with salt and pepper and stir. Cook for 5-6 minutes until onions are beginning to become tender and translucent. While onion is cooking, whisk together water, chicken boulion granules, 1/4 cup lemon juice, whipping cream, cornstarch, garlic powder, 1/4 teaspoon pepper, and 1/4 teaspoon salt. Set aside. To the saucepan, add mushrooms, basil, oregano, and thyme and cook for 5 minutes more, stirring occasionally to avoid burning. Add pasta to boiling water at this point. Cook pasta for 10 minutes before draining. As pasta is cooking, continue cooking vegetables. While mushrooms are cooking, cut zucchini and yellow squash in half lengthwise. Cut halves into 1/2" thick pieces. Add zucchini and squash to sauce pan and cook until crisp tender, about 5 minutes more. Add chopped kale and capers and cook an additional 2 minutes. Pour liquid mixture into saucepan and increase heat to medium high. Bring mixture to a boil and stir until slightly thickened, about 3 minutes. Drain pasta and add cooked pasta to saucepan. Stir to coat all pasta with sauce. Season with additional salt and pepper, if needed. 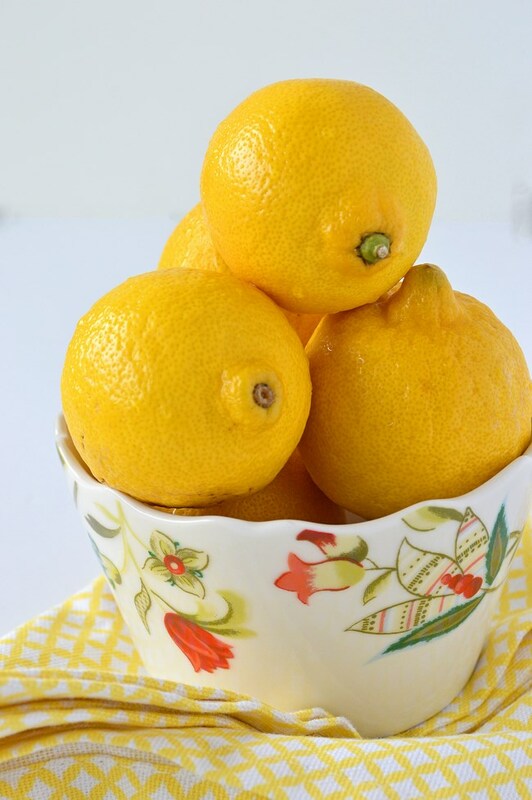 Add extra lemon juice if desired. Serve immediately.